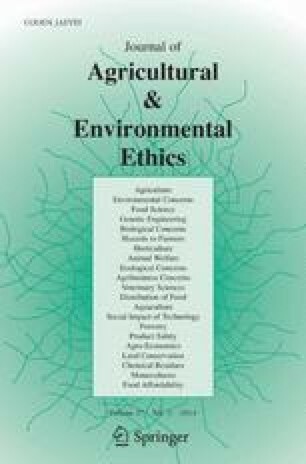 In response to Albrecht et al.’s (J Agric Environ Ethics 26(4):827–845, 2013) discussion on the ethics of assisted migration, we emphasize the issues of risk and scientific uncertainty as an inextricable part of a comprehensive ethical evaluation. Insisting on a separation of risk and ethical considerations, although arguably common in many policy contexts, is at best misguided and at worst damaging. This work is part of the Academy of Finland research project number 258144 “Constraints and Opportunities of Assisted Dispersal of Plants in Climate Change Adaptation–Biological, Legal and Ethical Analyses (CO-ADAPT)”. Helpful comments by Maria Hällfors, Elina Vaara and Helena Siipi on an earlier version of this response were much appreciated. European Environment Agency (EEA) (2001). Late lessons from early warnings: The precautionary principle 1896–2000. http://reports.eea.eu.int/environmental_issue_report_2001_22/en/Issue_Report_No_22.pdf. Accessed 12 Aug 2013.